Build your Box – Stop Wishing, Start Doing! Have you ever dreamt about the perfect Box? What would yours look like if you could design it yourself? Here is what you need to know. Stop wishing and make it happen! A big plus of CrossFit® (I know, there are many!) lies in its simplicity. A few bars, weights and a creative mindset is enough to get started. No gym machines, no treadmills, no wellness program. Hence it enables many young entrepreneurs to open their own box on a manageable investment. In case you are one of them: Here is what you really need to turn passion into profession! THE RIG – HEART, ENGINE AND CORE OF ANY BOX! Undoubtedly the rig is the centre of attention in every box. 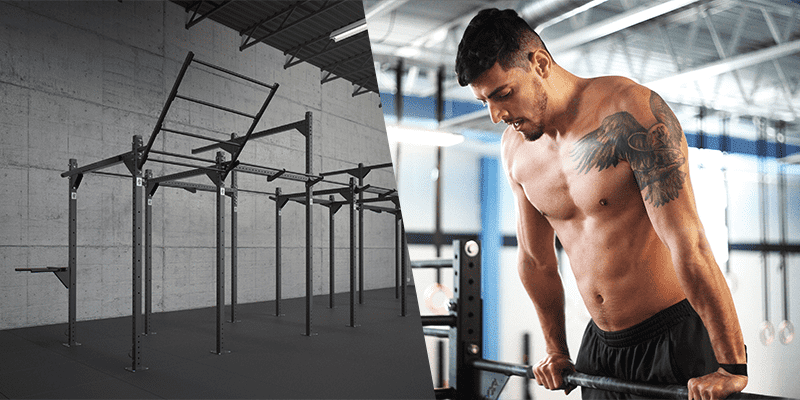 It provide stations for squats and presses as well as pull ups, dips, toes to bar, muscle ups … a (seemingly) simple steel construction that facilitates thousands and thousands of different WOD variations. With regards to its importance, the diligence of its purchase must be equally as high! The rig will have to prove 110% stability each and every day. It must withstand a whole group of Crossfitters swinging on it, smashing it with barbells and the like. Therefore high quality steel (with a thickness around 80mm), strong weld seams and solid construction is an absolute necessity. Before you decide to look for a provider, take a look and where possible, try it out for yourself. Also, official EU-wide applicable safety certifications like the ISO 20957-1:2013 are pertinent to ask for as well. Besides the stability, the grip of the bars is a point of huge importance. There is nothing more frustrating than failing your pull ups during workouts because of a slippery surface. A sand blasted and well coated bar will help to prevent grip fatigue – and will potentially save spending on chalk! Furthermore, we recommend looking for details such as numerated holes for the J-Cups (so you can avoid slanted bars on the initial set up) and holes also at the bottom part of the uprights (to set up a barbell for floor presses or fixing a band for numerous exercises such as banded planks). FREE STANDING OR WALL MOUNTED? Both options come with pros and cons, and the decision should largely depend on the size and shape of the facility. 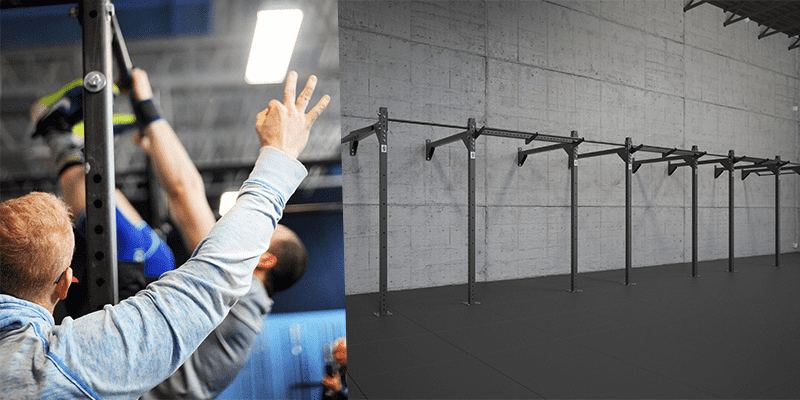 While a long but narrow room benefits from a wall mounted rig (to provide more space in the centre of the room), the free standing variation fits well with a broad or squared arrangement, where it provides a higher number of squat and pull up stations. Additionally, the free standing rig is often eye catching and impressive, while the wall mounted set up feels more stable to some people. In conclusion: There is no one-size-fits-all solution. 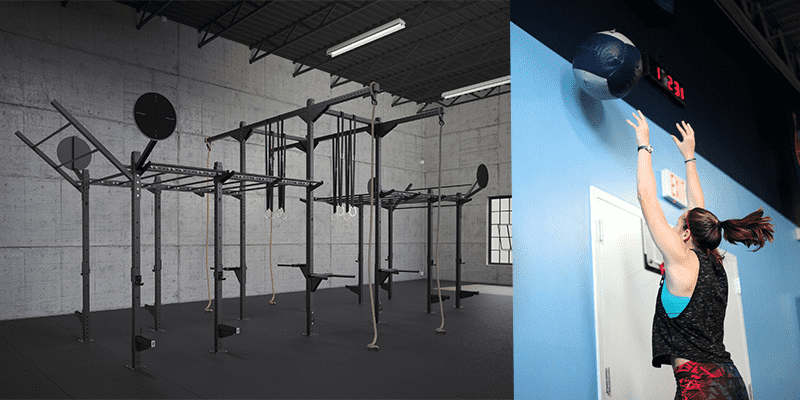 HOLD STRONG’s “Build your Gym” provides countless combinations and possibilities to create a rig that matches all the spatial conditions as well as your exact idea of function and design. This includes optional stainless steel for outdoor installation! They also offer a photorealistic 3D planning service to make your ideas and thoughts visible and prevent any bad surprises. Along with delivery, assembly and maintenance, HOLD STRONG is on your side all the way to the first WOD. 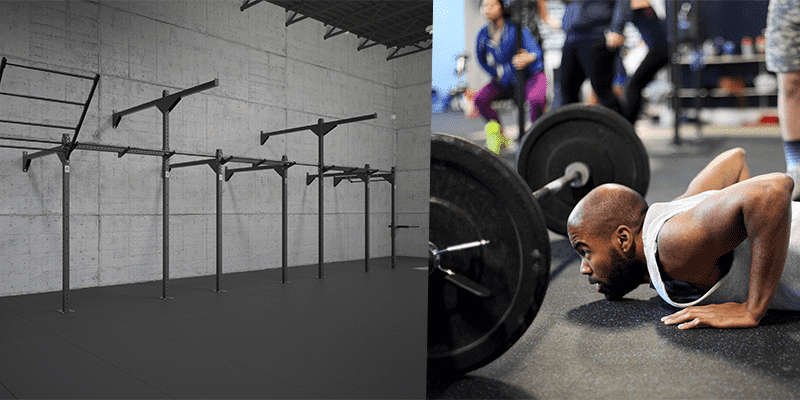 The right gym floor can be a topic that causes sleepless nights. Nothing fun, nothing fancy, just of essential importance – like the salt in your food. So what should you consider? The gym floor has to protect the concrete on the ground from dropping three digit weights from a 2m + height. It also has to absorb noise while limiting the weight’s rebound at the same time. Gummi granulate is a very popular choice that fulfills these requirements perfectly. The material is recycled, reasonable priced and easy to clean. A thickness of at least 10mm ensures protection and sound absorption, also is also suitable for a second level facility. The floorings are sold in squared or puzzle shaped single pieces so that it can be easily laid without additional glue or tape, and cut into shapes that fits into corners and around objects. Also, single tiles can be used to set up temporary “lifting platform” outdoors – an amazing option for the summer! Floor from the roll can be laid even faster and is therefore a good solution for huge areas. The gaps between the rolls are minimised which creates an overall smooth surface and is free of any tripping hazards. Weightlifting is, and will always be, the main part of CrossFit, so don’t save in the wrong place. Make sure to provide bars that are actually made for the daily, intense usage and can handle chalking, dropping and slamming. It doesn’t necessarily have to be a pure olympic or powerlifting bar – the hybrid variations, on the contrary, are the perfect variation for WODs that could combine a power clean with a squat and so on … just make sure that you provide both male (20kg weight) and female barbells (15kg, shorter and with a smaller diameter). Note: 60% of all box member worldwide are female! So don’t make the (common) mistake to order more material for your male athletes, also because man can always use a women barbell while the converse is more of an issue. Without a question, the choice for plates should fall on bumper plates. They absorb shocks, noise and protect your floor, bars, nerves and neighbourhood’s peace of mind. Gummi granulate is, just like the flooring, an amazing material to soften the dropping of heavy barbells, it looks good and is technically unbreakable. Plates made out of harder rubber are usually lower in price but provides less sound insulation and have a higher risk of splitting due to the lowered shock absorption. Plates with the IWF standard collar opening of at least 50.40 – 50.80 mm will match all regular Olympic bars. CARDIO MACHINES – KEEP ROWING! The indoor rowing machine is not only a nice-to-have thing, but a must in every CrossFit box! So make sure you provide at least one rower for every 2 spots you offer in a class.The Concept 2 is a classic: Smooth with a natural pulling motion, it is robust with a long battery life and various programming options to suit any WOD. … and all the rest! Next to these essentials, there is so much fun stuff like dumbbells, matador dips, benches, climbing ropes, slam balls, atlas stones, parallettes, sleds, yokes … not to mention all the mobility tools, chalk bucket and decorations for your changing and shower rooms. It is indeed a broad project so approach it with a plan, carefulness and the right supplier alongside!